Dan Rawley | Stand, spray and deliver. It’s not often that both clubs come away disappointed from a 3-2 win, but that’s exactly what happened at Edgar Street, home of Hereford United, in today’s clash with Torquay. This game was of critical importance to both clubs: Hereford, second-bottom in the table, needed to win and hope relegation rivals Barnet slipped up in order to secure their own safety, while Torquay desperately needed the three points to overcome Crawley and Southend in the battle for third place and automatic promotion to League One. The Bulls would have been high on confidence for a side fighting the drop, having shocked Crawley 3-0 in their previous outing. Cheered on by the majority of the 5,000-strong crowd at Edgar Street, Richard O’Kelly’s men were certainly in with a chance of surprising the league’s surprise package Torquay. The Gulls had suffered an uncharacteristic blip in form, drawing with Southend and Crewe at home and losing to AFC Wimbledon away, placing even bigger significance on this trip to the Welsh border. 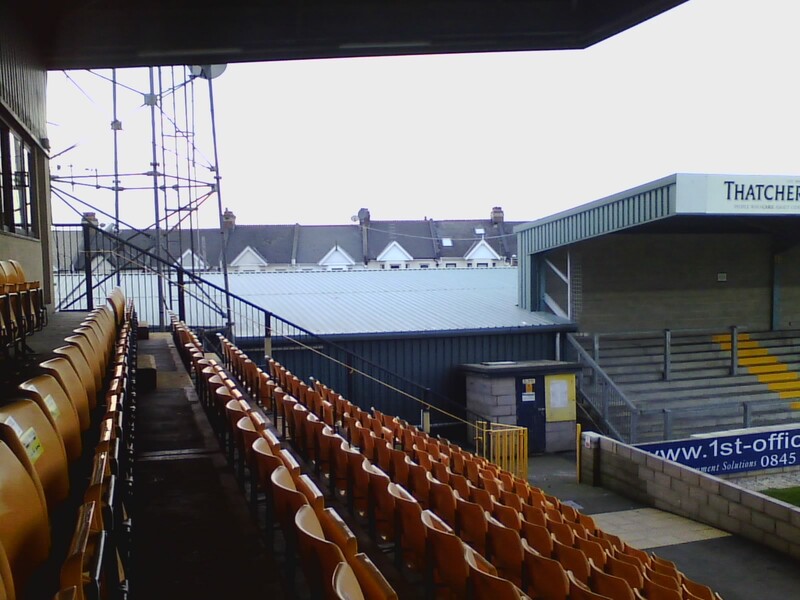 Torquay fans had been hoping Hereford would be relegated by the time the sides met on the last day, making their job significantly easier, but it was not to be. Hereford’s second came from a penalty after Lee Mansell was adjudged to have fouled Purdie ten minutes before the break. After custodian Bobby Olejnik had extended his excellent penalty-saving record with a spot-kick stop against Crewe a week earlier, Gulls fans would have been quietly confident the Austrian could repeat the trick, but Pell proved otherwise. Purdie found the net himself four minutes later to give Torquay a mountain to climb in the second half. That mountain was reduced to a very large hill just 13 seconds after the break when substitute Ryan Jarvis dispatched Joe Oastler’s strike beyond Hereford goalkeeper Adam Bartlett. Torquay continued to press for a route back into the game, and just after the hour Taiwo Atieno, another sub, reduced the deficit to a single goal after pouncing on a rebound from Kevin Nicholson’s free-kick. The impossible was now simply unlikely, but unfortunately for the Gulls and their 1,400 travelling fans, that was as good as it got. As news of a breakthrough from Barnet in their game against Burton reached Edgar Street, the atmosphere among the home fans unsurprisingly become more subdued. Even a win would now not be enough, and the tension on the pitch was evident as Torquay skipper Lee Mansell enjoyed “fisticuffs”, as a Final Score reporter put it, with Bulls defender Byron Anthony in the closing stages. A mammoth eight minutes of injury time simply delayed the agony for both sets of fans – Hereford were condemned to the Conference and, contrary to the oft-heard chant at Plainmoor, the Gulls were not going up – automatically, at least. Although the Yellow Army will be disappointed to have to endure the lottery of the play-offs after such a great season – the Gulls had been tipped for mid-table mediocrity at best by so-called “experts” – they should look back on Martin Ling’s first season in charge with pride and satisfaction. Whether Ling can conjure a return to form from his small, tired squad remains to be seen. What is certain is that Cheltenham will prove to be tough opponents in the play-off semi-final. Hereford came so close to saving their skins after showing late improvement, losing just one of their final six league fixtures. Unfortunately, it was too little, too late, and it is fair to say that relegation always looked likely – a dire record of one win in their first thirteen games set the tone for an appalling season that has included embarrassing 6-1 and 4-0 reverses at home. Should Richard O’Kelly, only appointed in March, stick around for next season, they could bounce back at the first attempt. Hereford fans will certainly hope so.